ThunderBolt Flash Drives - How Fast? When? What Cost? 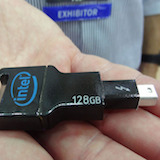 A few years back, Intel showed a prototype ThunderBolt flash drive brought out from the depths of their labs for a public viewing at an electronics show. And that was the last we saw of it. Major storage manufacturers never entered this category of PC and Mac backup devices. Back in the days before SuperSpeed USB 3.0 and 3.1, we briefly saw FireWire 400/800 flash drives from OCZ and Kanguru that marginally outperformed their USB 2.0 counterparts in that era. The big issue for a Thunderbolt flash drive is the $50-$75 price premium ThunderBolt entails. The extra cost of the ThunderBolt chipset and it's licensing requirements isn't cost-justifiable in the eyes of many consumers. Dimensions: 3" x 2.5" x .65"
Another slim, flash drive shaped option is from Transcend which pairs an ultra-fast NVMe PCIe fash module with a narrow Thunderbolt enclosure which supports TBolt 1 & 2 for legacy Macs with mini DisplayPort style Thunderbolt ports. The ThunderBolt thumb drive market that has yet to really materialize is being made moot by the arrival of the Type-C ThunderBolt 3 interface on new Apple Mac's and Windows PC's. Using the SAME connector as USB-C and with the ability to 'Tunnel' USB 3.1 protocols over the TBolt3 bus, consumers will be able to plug a USB-C flash drive into a ThunderBolt3 port and never really notice or care about the difference. Even with USB 3.1's increased bandwith to 10Gbps, only the most high-end keychain type drive using PCIe NVMe SSD modules can fill the USB 3.1 Gen2 pipeline anyways. Expect to simply see alot of marketing billing USB 3.1 Type-C flash drives as 'ThunderBolt 3 COMPATIBLE' although they'll be functioning using somewhat slower USB protocols. Perhaps some of the reasons for the delay in ThunderBolt flash memory drives reaching the market is the Price / Performance benefits (and more accurately, the lack thereof.) It would take some serious price reductions in the cost of licensing ThunderBolt chipsets to justify much of a market for ThunderBolt keychain style drives. As we've seen in the desktop, portable and pocket-drive SATA interface SSD markets, 5Gbps SuperSpeed USB 3.0 bandwidth can pretty much handle the maximum data transfer rates of the most current and fastest USB3 thumb drives quite easily. So there's little point in paying more for a ThunderBolt keychain drive to achieve near identical performance over cheaper USB 3 products. With the top performing USB 3.X flash drives from companies like SanDisk and Patriot currently maxing out with peak Read / Write speeds slightly over 300MB/s, the NAND flash memory itself -- and not the computer interface is still the limitation. Substituting a significantly more expensive ThunderBolt chipset with direct access to the computer's PCIe bus for a USB 3.0 or 3.1 controller chip wouldn't make the flash memory any faster. At best you might see a trivial, minor increase in performance simply because (like FireWire 400/800) ThunderBolt is a more efficient protocol without some of the extra CPU utilization and overhead of negotiating a data transfer that the USB Universal Serial Bus device specification involves. Even when a typical single 6GBps SATA III solid-state drive is connected to a ThunderBolt or USB 3.1 port they tend to utilize only about half of the available bandwith on either computer interface. Much of this is simply because most data transfers in every-day real-world use sparse, spotty and intermittent Read / Write requests. Most data requests are NOT SUSTAINED, BANDWITH INTENSIVE processes much of the time.